I currently have four surname notebooks set up although I am working only in the one for now. There is one notebook for each of my grandparents’ surnames. Working in only one surname notebook at a time is for my own sanity. I am concentrating on going back through and documenting my direct line ancestors first. Then I will come down through the lines documenting their siblings. (Since I am prone to major distractions steering me off course, this may all be a pipe dream. Eventually I want to work on my other surnames though, so I keep deluding myself.) Okay, I have added in the names for other family members besides my direct line to my current notebook but I haven’t added any sources. Well, not that many… LOL Nevermind. The first place I am going to start is with the Family Group Record (FGR). Here is a PDF of the Family Group Record I use in OneNote. It’s helpful to know exactly where that FGR is supposed to go in my notebook. 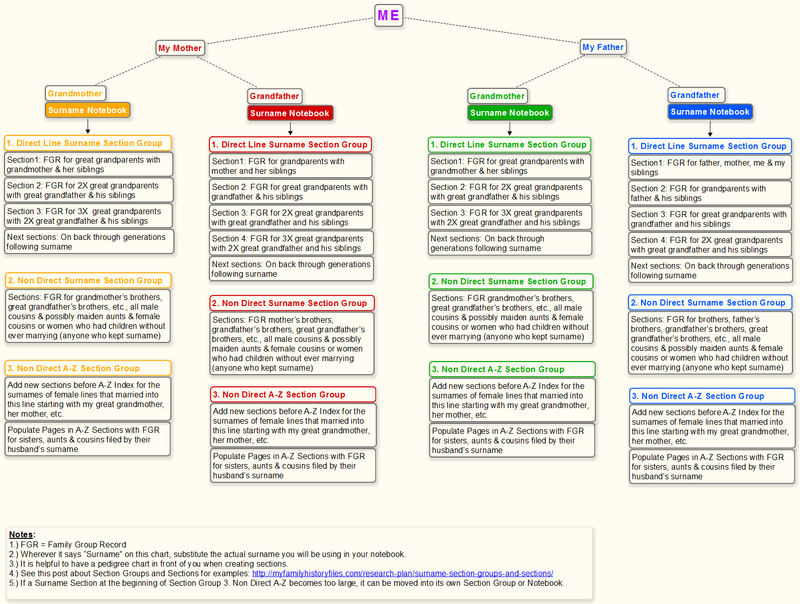 I can figure it out using my pedigree chart but I made a mind map chart that might help some of you see where everyone belongs. Here is a PDF of the chart pictured below. Since I am related to 90% of the Williamsons in the Rochester, New York area, I collect every record I come across that is for a Williamson. Picking a random record… I have a marriage license index record for Stella (Williamson) Mackwood’s second marriage to Louis H Baumann. Stella is my grandfather’s oldest sister. First, she is listed as a child on her parents’ Family Group Record. So where does the Family Group Record for her second marriage go? Since she is a sister/aunt, she goes in Section Group 3. Non Direct A-Z of my Williamson Surname Notebook. The Family Group Record for Stella and Louis H Baumann goes in the A B Section. There is also a Family Group Record for her and her first husband, Robert Nelson Mackwood, and their children in the M N Section. 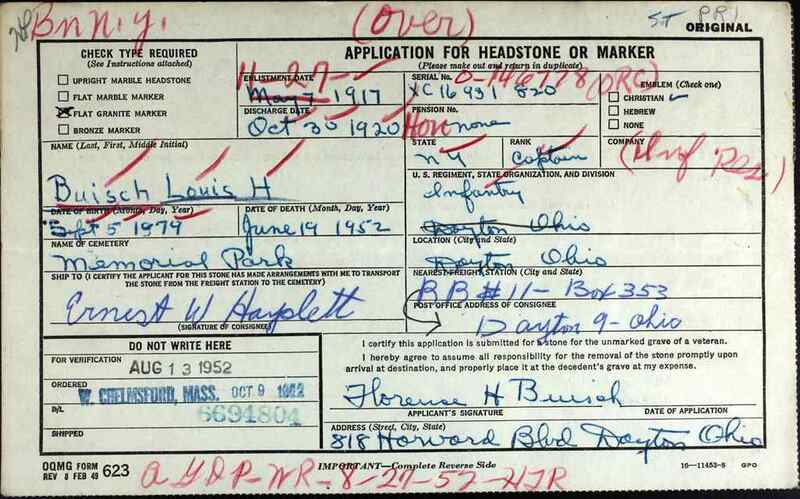 Next record… A military headstone application for Louis H Buisch. Buisch is my father’s mother’s surname. (Green notebook). Louis Buisch is my grandmother’s brother. His Family Group Record goes in 2. Non Direct Surname Section Group. 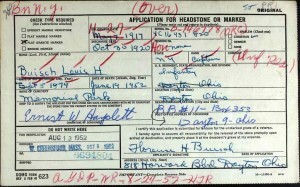 Erin Williamson Klein, “Who goes where.” My Family History Files, 14 March 2015 (http://myfamilyhistoryfiles.com/organization/who-goes-where/ : [access date]). Please do not copy without attribution and link back to this page. Hi Erin Thank you for the display of FGR. I am going to try and work through them. I like what you have done – absolutely amazing work. I’m a visual learner. Ok Just to be clear I am in a direct line, and my brother and sister are in the Non Direct Line? Also Why do you do a page for your siblings in the FGR and then have them another page in your A-Z or Non Direct. What do you have listed under their names – the click down arrow on the eg Delores Elizabeth (1927) Do you just have a link to the a new section or page for her? I’ve been reading and re-reading your information. I have started Note books on my grandparents in OneNote and inserted much of my digital information. Now I came across your lovely Source page. I’m re-doing that for the people but I need to get the people into the proper structure. I’m sure it’s quite simple for some people but I’m teaching myself a whole new way of saving my information. I love OneNote. I have my tree in ancestry.com and FTM 2014 so I’m ok there. I just finished renaming and organizing my digital files. I like to make them by records – birth, death etc. I have 12 books and have them labeled and all the information in page perservers, and labels for each person, or couple. So now need to get them into OneNote. Thanks for your patience. We are all in this together. Just to let you know. I have been working all weekend and I think I have got it. I’m not happy putting my sister with her husband under the non direct A-Z group – but I will come up with something I’m happy with. I understand that you have children on some of the pages instead of a section. I’ll see how it goes when I get more into it. I need to structure before I can do some more research. Thanks for your lovely graph’s. Terrific work. 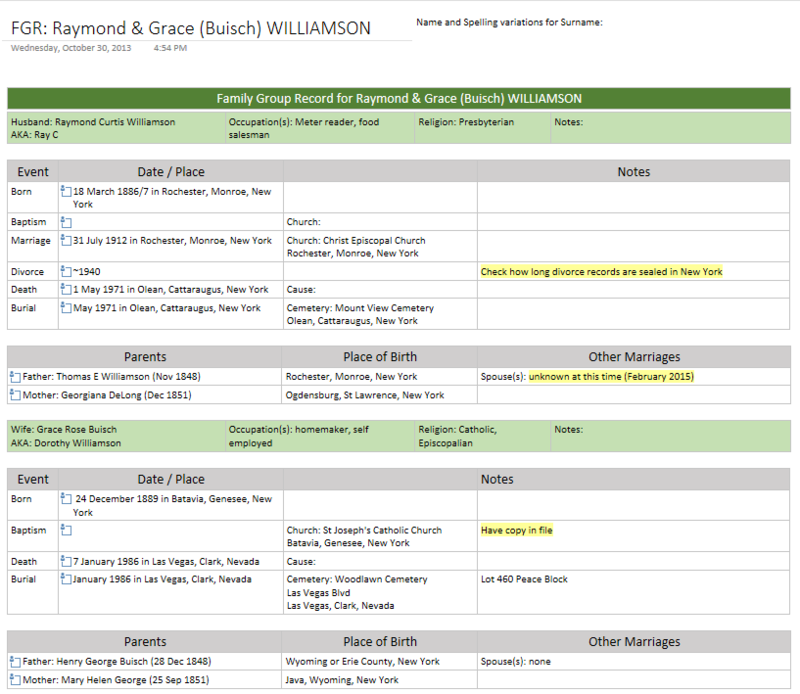 In the drop-down menus under the couple’s Family Group Record and the children’s names is the Source Log and Source Description. Since records are generated about us as children of our parents and then again as we form our own families with children, I have children listed with their parents and then make a new family group record for them when they get married and have children. Using Delores as an example, if I have her birth record, baptism and confirmation records, these 3 records would go under her name in her parents’ family group section. Later she marries a man with 2 children from a previous marriage. They do not have any children together. Delores gets listed in the A-Z index as the second wife of her husband under his surname. Her husband also has his first wife listed and both children. Marriage and death records get listed there. Because I started out organizing my physical notebooks this way, it works for me. 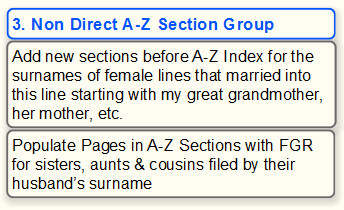 Another option, instead of the Direct, Non Direct and A-Z Section Groups, might be to divide the alphabet into groups and then have all your Family Group Records sorted into sections alphabetically. You could divide the alphabet into 5 Section Groups for example: Section Group One includes all surnames A-E, Group Two surnames F-J, Group Three K-O, Group Four P-T and Group Five U-Z. Perhaps you could have a sixth Section Group with just your immediate family members, each in their own section group. Thanks for the comments. Actually I have been working on one Surname as you mentioned. In the children under their parents you have a Source Log and Source Description – where do you link the female to her husband under her family. Do you create a link from her to her FGR under her name or just the link in the index pages? I guess you could link them on the Source Log under note – married ??. I love this post, it is still relevant to my needs today. I’ve been working on my hardcopy notebooks that I can set on the coffee table for the grandkids to pour over, but also I realized I need a digital copy that I can send to other family members easily, and search easily. The first reason creates redundancy so I won’t lose everything in a house fire. The last reason is because I’ve just started two name-specific genealogy blogs, and I find it difficult keeping my head above water, trying to remember what I wrote about last. I’ve been repeating myself. Also, in your experience, is it best to have a name-specific blog for the two unusual names, or should I have just one blog which would cover everyone? Subscribe to my blog and receive new posts by email. Aside from my own family history research, I also have 2 Surname Studies: Colepaugh mainly in the US and Schraven worldwide. Follow Erin's board Genealogy on Pinterest. Follow Erin's board Embellish Your Memories on Pinterest. 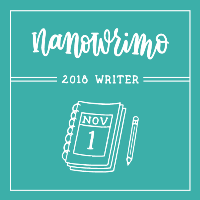 The NaNoWriMo challenge is to write 50,000 words during the month of November. Contents on my OneNote Tutorials are Copyright ©2014-2019 by Erin Williamson Klein. Powered by WordPress and WordPress Theme created with Artisteer by Erin Klein.